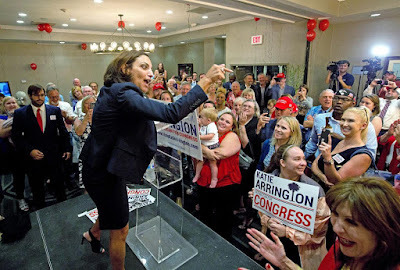 "In a monumental upset fueled by a Donald Trump tweet, U.S. Rep. Mark Sanford lost his Republican primary to Katie Arrington, a one-term state lawmaker who made loyalty to the president the centerpiece of her campaign. The defeat, which carries national implications, marks the first time Sanford has lost an election, which began with his first congressional bid in this very district in 1994. President Trump--making a move unprecedented in South Carolina history--in a late afternoon tweet asked state voters to replace Sanford with Arrington, going so far as to say Sanford is "better off in Argentina," a reference to his adulterous affair when he was governor in 2009. The message was delivered less than three hours before the polls closed, illustrating Trump's willingness to take out one of the few Republican congressmen in recent months willing to call out the president for his sometimes crude behavior. Arrington, a Summerville Republican, led by 3,000 votes with 80 percent of the vote in. Dimitri Cherny, the third candidate on the Republican ballot, pulled in about 3 percent despite running as a Democrat in previous elections. The final results will be certified later this week. Arrington will face Democrat Joe Cunningham in the Nov. 6 general election. Cunningham, a 35-year-old construction attorney, handily defeated Democrat Toby Smith. The loss also parallels the defeat of Republican Bob Inglis in his 2010 conservative Upstate congressional primary at the hands of another political wildcard, the tea party movement. Trump's tweet, delivered after his return from his Singapore and a meeting with North Korean leader Kim Jong-un, additionally called Sanford "nothing but trouble." 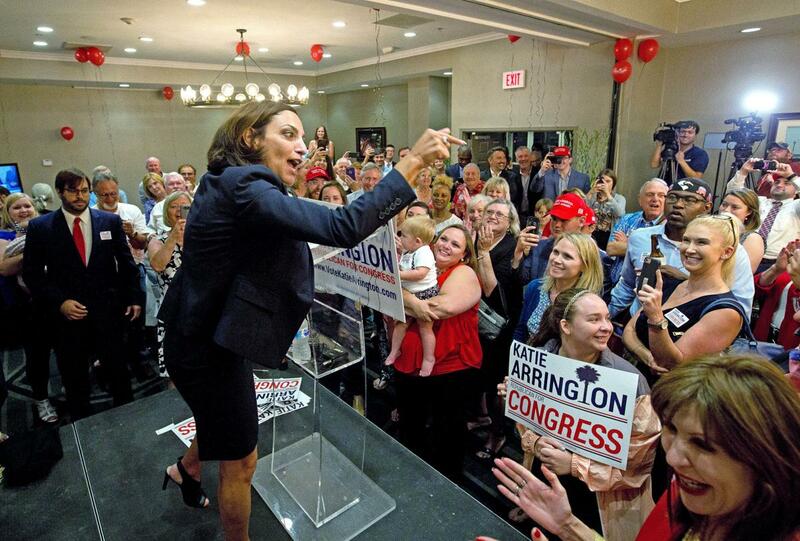 Arrington, meanwhile, looked forward to her odds in a GOP-leaning district and emerging as a congressional candidate with only two years of experience in the S.C. Statehouse.